Apollo Endosurgery, Inc., a global leader in less invasive medical devices for bariatric and gastrointestinal procedures, announced that it has received Special 510(k) clearance from the U.S. Food and Drug Administration for OverStitch™ Sx Endoscopic Suturing System. The OverStitch Sx System, a new, full-thickness flexible endoscopic suturing system, received initial 510(k) clearance in November 2017. The Special 510(k) addressed an accessory to the system that is intended to ease the attachment of the device to compatible endoscopes (single-channel endoscopes with diameters ranging from 8.8mm to 9.8mm). The Special 510(k) clearance is the last regulatory requirement needed prior to the system’s introduction into the US market. Flexible endoscopic suturing using Apollo’s current version of OverStitch™ is an important tool for both surgeons and gastroenterologists, but it is currently only compatible with a limited number of dual-channel endoscopes and physicians without access to this specific capital equipment cannot leverage the benefits of endoscopic suturing. OverStitch Sx removes this access limitation, and once available, the combination of the current version of OverStitch and OverStitch Sx will provide most physicians with access to the benefits of full-thickness flexible endoscopic suturing regardless of their hospital’s selection of endoscopic capital equipment or endoscope manufacturer. The OverStitch™ and OverStitch™ Sx endoscopic suturing systems enable advanced endoscopic surgery by allowing physicians to place full-thickness sutures from a flexible endoscope. This new technology enables a secure approximation of tissue endoscopically and a wide range of less invasive solutions for physicians who treat defects in both the upper and lower GI tract of their patients. Additionally, physicians are leveraging endoscopic suturing to perform a variety of advanced bariatric procedures. Apollo Endosurgery, Inc. is a medical device company focused on less invasive therapies for the treatment of obesity, a condition facing over 650 million people globally, as well as other gastrointestinal conditions. 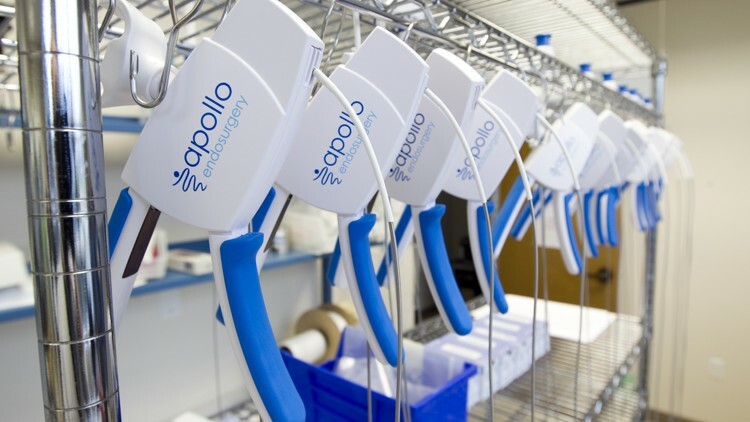 Apollo’s device based therapies are an alternative to invasive surgical procedures, thus lowering complication rates and reducing total healthcare costs. Apollo’s products are offered in over 70 countries today and include the OverStitch™ Endoscopic Suturing System, the ORBERA® Intragastric Balloon, and the LAP-BAND® Adjustable Gastric Banding System. More on the GI endoscopy market in the U.S. can be found in a series of reports published by iData Research entitled the U.S. Market Report Suite for Gastrointestinal Endoscopic Devices. The suite covers reports on the following markets: GI flexible endoscopy, capsule endoscopy, virtual colonoscopy, endoscopic retrograde cholangiopancreatography (ERCP), stenting and dilation, biopsy, specimen and foreign-body removal, hemostasis, enteral feeding, anti-reflux, and Barret’s Esophagus. The iData report series on GI endoscopic devices covers the U.S. and 15 countries in Europe including Germany, France, the United Kingdom (U.K.), Italy, Spain, Benelux (Belgium, Netherlands and Luxemburg), Scandinavia (Finland, Denmark, Sweden and Norway), Portugal, Austria and Switzerland. Reports provide a comprehensive analysis including units sold, procedure numbers, market value, forecasts, as well as detailed competitive market shares and analysis of major players’ success strategies in each market and segment. To find out more about GI market data or procedure data, register online or email us at [email protected] for a U.S. Market Report Suite for Gastrointestinal Endoscopic Devices brochure and synopsis.